The bearer of God's secret messages to His chosen ones. One of the two highest ranking angels. He is the leading angel who stands in the presence of the God/Goddess as a co-ordinator. He is the Archangel of annunciation, humanity, resurrection, heavenly mercy, vengeance, death, revelation, truth, and hope. Bringer of news and heralds the revealing of answers. Maker of changes. He is the Patron Saint of Communications Workers. The name Gabriel means "Man of God" or "God Has Shown Himself Mightily." It appears first in the prophecies of Daniel in the Old Testament. This Angel announced to Daniel the prophecy of the seventy weeks, (Daniel 9, 21-27). His name also occurs in the apocryphal book of Henoch. He was the Angel who appeared to Zechariah to announce the birth of St. John the Baptizer, (Luke 1, 11), the messenger Angel who announced to Mary that she would bear a Son who would be conceived of the Holy Spirit, Son of the Most High, and the Saviour of the world, (Luke 1, 26), and the angel who buried Moses. Within all of the legends of birthing, Gabriel as been accredited as the angel who selects souls from heaven to be birthed into the material world and spends the nine months as the child is being developed informing the new person of what he or she will need to know on Earth, only to silence the child before birth by pressing his finger onto the child's lips, thus producing the cleft below a person's nose. Gabriel explained to Daniel his vision of a ram and a billy-goat foretelling Alexander the Great's conquest of Persia and a prophecy foretelling the freeing of the Israelites. 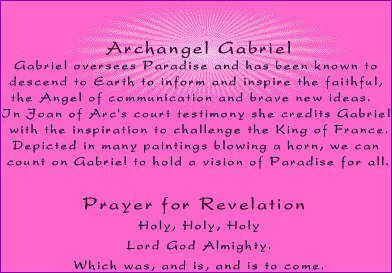 In both these cases the Archangel is mentioned by name, but it has also been suggested that Gabriel is the angel who wrestles with Jacob in the form of a man and that he was involved in the destruction of Sodom and Gommorah. Enoch says that Gabriel was sent to destroy the giant children of the fallen 'watchers' and did so by turning them against each other In 'Paradise Lost'. It was Gabriel who dictated the Koran to Muhammad. According to legend, it is Gabriel who will blow the horn announcing the second coming of Christ. His symbols are the lily and the trumpet. The name Gabriel means "man of God," or "God has shown himself mighty." It appears first in the prophesies of Daniel in the Old Testament. The angel announced to Daniel the prophecy of the seventy weeks. His name also occurs in the apocryphal book of Henoch. He was the angel who appeared to Zachariah to announce the birth of St. John the Baptizer. Finally, he announced to Mary that she would bear a Son Who would be conceived of the Holy Spirit, Son of the Most High, and Saviour of the world. The feast day is September 29th. St. Gabriel is the patron of communications workers and Postal workers. The name "Gabriel" has been interpreted "Strength of God." Of the three Archangels mentioned in Holy Scripture, St. Gabriel appears to be the King of Heaven's chief ambassador, fittingly endowed with dignity, graciousness, knowledge and discretion. And of all the embassies on which he was sent, the greatest was to announce the wonderful mystery of the Incarnation and the mighty work of the Redemption through the shedding of the Precious Blood of the Incarnate Word. He it was, who at the Annunciation first spoke these words to Mary which ceaselessly re-echo round the earth: "Hail, full of grace, the Lord is with thee, blessed are thou among women." (Luke 1:28) And he it was who there adored with her the Word made flesh to dwell amongst us. He was, we may say, the first Adorer of the Precious Blood on earth, and the first to pronounce the sweet name of Jesus, Savior. He is also considered our Blessed Mother's guardian in a very special way. We cannot honor Mary by devoutly reciting the prayer that is most pleasing to her, without at the same time honoring the glorious Archangel who was God's instrument in her exaltation. Their names are linked in Heaven and on earth. Though his name is not expressly mentioned, we may well believe what tradition tells us--that it was St. Gabriel who announced to the Shepherds on the hills of Bethlehem the Birth of our sweet Lord, and that it was he who led the multitude of blessed spirits who sang around the crib the heavenly song: "Glory to God in the highest and peace on earth among men of good will." It was he also who consoled dear St. Joseph in his sorrows, and accompanied the Holy Family in their flight into Egypt. And now, in addition to these ancient celestial assignments, St. Gabriel has been proclaimed Patron of radio and television by Pope Pius XII. Lastly, St. Gabriel is looked upon as the Angel who comforted Our Lord when He suffered His bloody Agony in the Garden of Olives. Father Walter Elliott has written inspiring pages on this consoling angel. He says in part: "In that hour the highest Angel could not vie with the meanest child of Adam as a comforter of Jesus. Never did He feel so much a man as when He began to sink deeper into man's wickedness and woes. Here then was a new sorrow disguised even in His comfort. For not only did He crave comfort directly from His Father and yet must be content with an Angel's instead, but next to His Father's, He craved sympathy from His own kind, His own flesh and blood, His chosen men, and an utterly different comforter was given Him C the while that the Apostles slept and waited... Yet, notwithstanding all this, the Angel's coming was a gracious boon from His Father. "For now there suddenly burst upon Jesus a vision of blessed peace. The devils are gone who have been tormenting Him. Oh, what a difference -- this gentle being, and just as strong as gentle, full of brightness and affection, all beaming with hope, and peace, reverence and sympathy. How sweet a visit, how welcome a comfort. Hope rose in His Heart, though we hardly dare say joy... If we would speak of perfect kindness, we call it angelic; or perfect peace, we call it heavenly. Thus Heaven vouchsafed to Jesus an interval, however brief, of its own gentle kindness, deep peace and rest. The Angel strengthened Him and Our Redeemer received at least a passing comfort from this most affectionate and reverent herald of celestial peace. He merited our eternal thanks for comforting our Champion in the direst moment of His awful conflict. "Christ knew that the only comfort possible for Him was within the gift of men alone, that is to say, their willingness to suffer with Him. But when the Angel was come, and before he vanished away, our saddened Redeemer thanked him lovingly, very grateful for his affectionate ministry. "Meanwhile, how deep the awe of the Angel. How profound from that hour his reverence for our human nature, which in His Divine Master, he saw forming one Person with the Deity itself, and which he knew, even in the lowest grade of humanity, was being ransomed at such a Price. There is much joy in an Angel's office of helping sinners to repentance. What joy then, is this Angel's, since the foremost Penitent of the whole race is here, the One Whose contrition is the foundation source of every penitent's saving grief, and it is his unique privilege to attend Him and console Him!" "These are the proofs," concludes Dom Gueranger, "which St. Gabriel gives of his deserving his beautiful name, 'Strength of God.' God has employed him in each stage of the great Work in which He has chiefly manifested His power; for Jesus, even on the Cross, is the Power of God, as the Apostle tells us. The whole human race is indebted to thee, O Gabriel! Blessed messenger of our Redemption whom God selects as His minister when He would show His power, we beseech thee, offer the homage of our gratitude to Him that thus sent thee." "Angel of strength, 'twas thine to see the pang of Love's Gethsemane. He stood a Master to defy the fiercest rage of earth and sky. Because my God Hath willed it so." This glorious Feast, normally celebrated on March 25th (although sometimes transferred because of the liturgical precedence of the observances of Lent and Holy Week), is called by some theologians and spiritual writers the "greatest day in the history of mankind." It was on this day that the Word became Incarnate in the spotless womb of Mary (the House of Gold, the Living Tabernacle, the Living Ark of the Convenant). At the humble Fiat of the chosen Virgin, the long-awaited Savior was conceived of the Holy Ghost. The "history" of man's redemption began in earnest as the Immaculate Lily of the Most Holy Trinity humbly rejoiced in the Will of the Eternal Father. And thus it has also been a Feast most dear to the hearts of all true devotees of Our Blessed Mother. From the earliest Christian eras there were held, by faithful Christians, beautiful solemn liturgies, processions, and other celebrations of this glorious Feast. These celebrations were satanically diminished by the Nestorian heretics of the early centuries and by the Protestant heretics of later times. But the most recent assault on this Feast comes from the vile beliefs and insidious influence of the freethinkers and the Modernists. As it has always been the prerogative of the Bishops to designate which Feasts were to be observed as solemn Feasts and Holy Days of Obligation within their ecclesiastical provinces (and in more modern times, more often by national conferences of Bishops), the areas in which freethinkers and Modernist clergy wielded great influence saw the tragic reduction by some Bishops so influenced, of a great number of solemn Feasts and Holydays. The bishops of the United States were among the worst in this regard. And thus, many solemn Feasts and Holy Days of Obligation were eliminated by the freethinking American prelates, including one of the most important and significant--the Feast of the Annunciation. While all faithful Catholics celebrate the Feast of the Annunciation in a special manner, those who are totally consecrated to Mary as De Montfort True Devotees--"Slaves of Our Lady"--celebrate this solemn Holy Day as their principal Feast of the year (not liturgically, of course, but devotionally). Holy Mother Church grants a plenary indulgence on this Feast to those so consecrated, under the usual conditions, as they renew their Total Consecration. Only those who have prayerfully read St. Louis Marie De Montfort's book, "True Devotion to Mary" can truly begin to understand its crucial importance to perseverance in this age of universal apostasy. Sister Mary Lucia of Fatima said that the De Montfort Consecration is the form of devotion and consecration requested by Our Divine Lord through the Immaculate Heart of Mary. may we honour the Incarnation of Your Divine son." and to respond to our Father. 'Be it done unto me according to Thy Word.'" by His grace, we may all be one. Blessed art though among women. and thou shalt call his name Jesus."